Creole Cream Cheese is a farmer style cheese, similar to a combination of cottage cheese and sour cream. Made with a blend of skim milk and half & half, once the curd is made and drained, a little heavy cream is poured overtop. This cheese had all but disappeared, but is back again and is now a real piece of cheese making history from the Creole Country of Louisiana. Add 1/4tsp calcium chloride solution to the milk and then warm to 70-80°F (I prefer to heat to 80°F and let it drop to room temp). 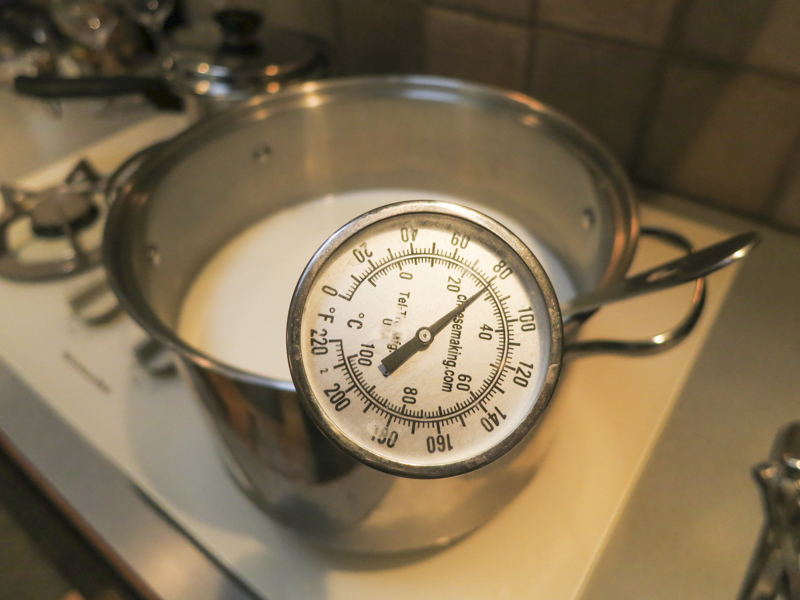 You heat this by placing the pot of milk into another pot, or sink, of very warm water (100-120°F). If you do this in a pot on the stove, make sure you heat the milk slowly and stir it well as it heats. Once the milk is at the correct temperature, the culture can be added. To prevent the powder from caking and sinking in clumps, sprinkle the powder over the surface of the milk and then allow about 2 minutes for the powder to re-hydrate before stirring it in. After the culture ha been mixed in well, cover the milk and allow it to sit quiet for 30 minutes. This will allow the bacteria to acclimate and get ready to do its work. The milk can be allowed to slowly cool to room temperature (the warmth was to make the bacteria happy while coming out of its deep frozen sleep). Once the milk has ripened, add 1/4 tsp of single strength liquid rennet and stir in for 1 minute using a gentle up and down motion. Allow the milk to become still. 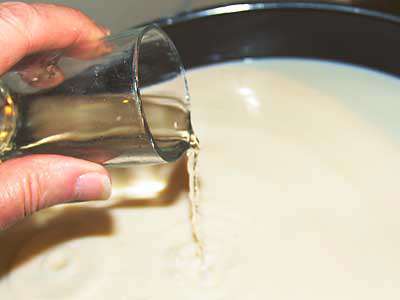 In about 12-15 minutes you will note that the surface of the milk has thickened slightly. You can test this with the tip of a knife. The surface tension will have increased, leaving a dimple where the knife touches the milk surface. This is the beginning of coagulation and the milk will continue to become firmer as it develops it's acidity. When you see this, you are assured that your milk is on it's way to forming a good curd. Keep covered and let sit quietly at room temperature for 12-15 hours while the culture works and the rennet coagulates the curd . The thermal mass of this milk should keep it warm during this period. It is OK if the temp drops a few degrees during this time. 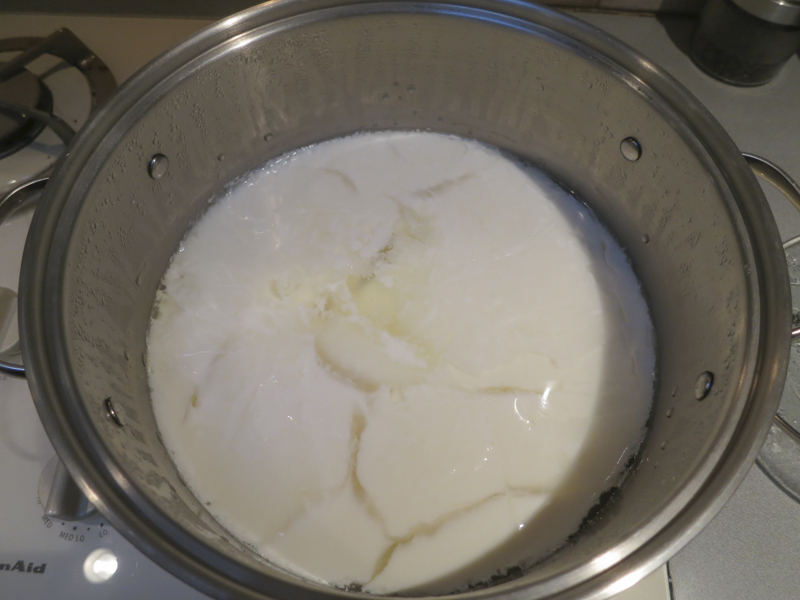 Do not stir or move the milk or you will disturb the curd formation. The longer the milk sits, the firmer the cheese will be. You can also make this cheese more to your taste by controlling the amount of acid produced by using a longer or shorter time. When the curd has become firm enough (you will find that it has a few cracks in it and separates from the edge) and the acidity has developed sufficiently (lactose converted to lactic acid), it is time to drain the whey. Prepare the curd by initially making vertical cuts about one inch apart and then repeating at right angles to the initial cuts. The result will be a checkerboard pattern and the whey will begin to rise to the surface from these cuts. Let this rest for a few minutes to release whey. 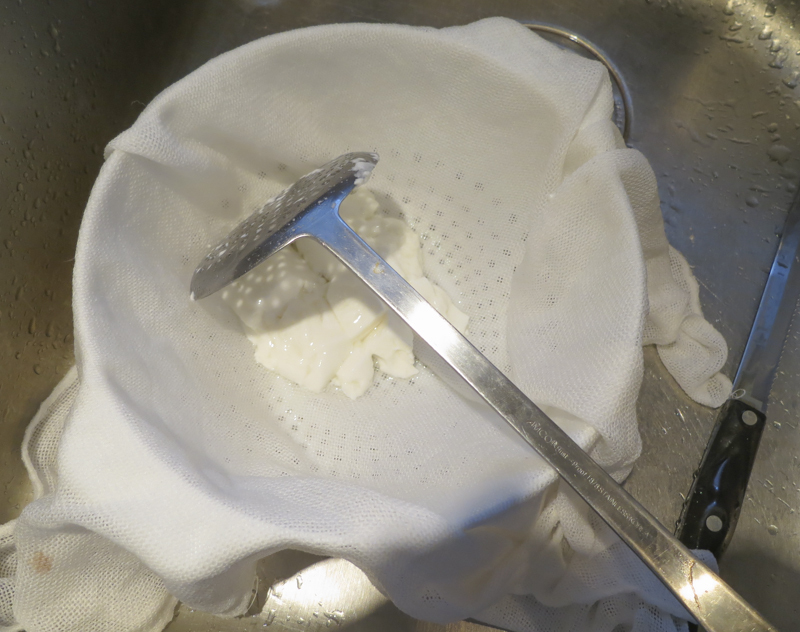 Meanwhile, line a colander (large enough to hold the gallon of curd and whey) with sanitized Butter Muslin. 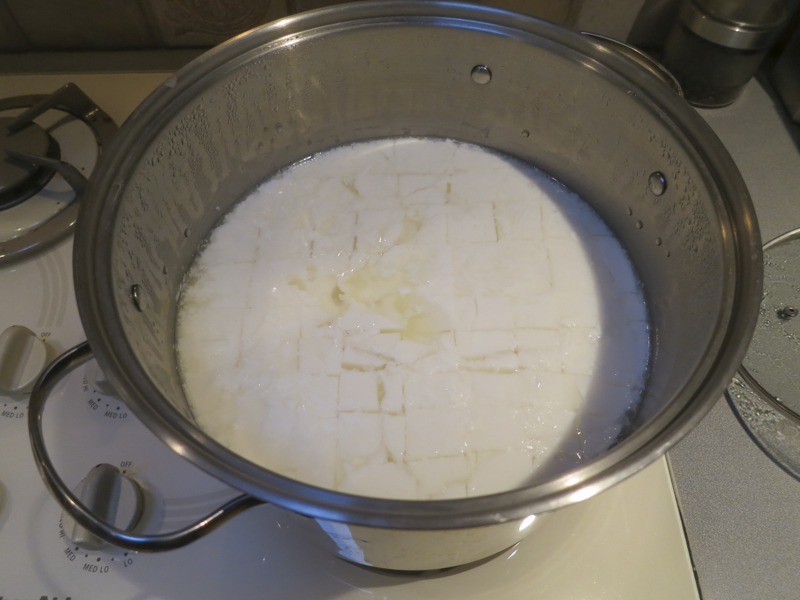 Using a slotted spoon or ladle, transfer your curd into the colander to begin the initial whey drainage. Allow this to drain into a pot so that the whey can be collected for other uses (this whey can make a very refreshing drink as is or mixed with fruit juices). This draining will continue for 1-2 hours while some of the whey drains off. You can use a shorter time for a moister cheese and longer time for a drier cheese. Prepare several cheese molds by sanitizing. Begin filling the forms in a round-robin fashion. 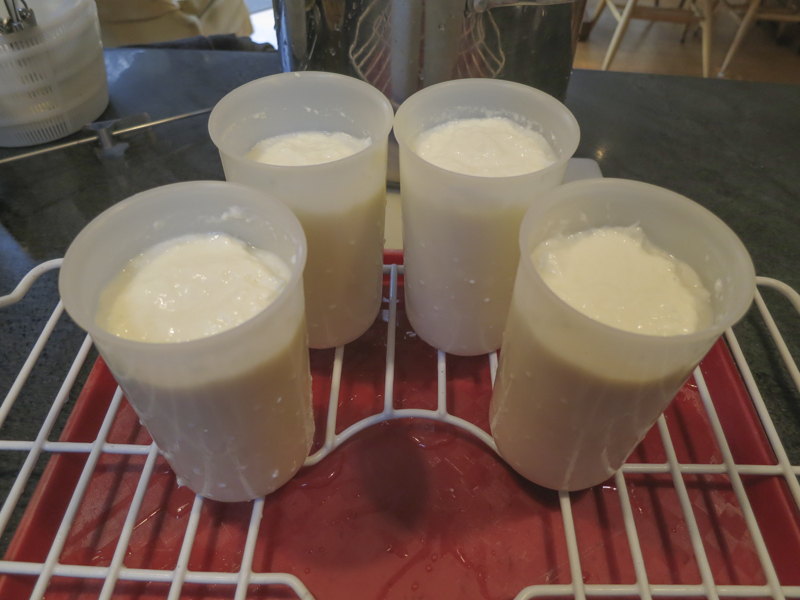 Gently transfer the curds using a ladle or spoon to the prepared molds. These should be placed inside a plastic box or pan to collect the whey that will be released. Here I use a sink rack to set the forms on with a whey collection pot below them. 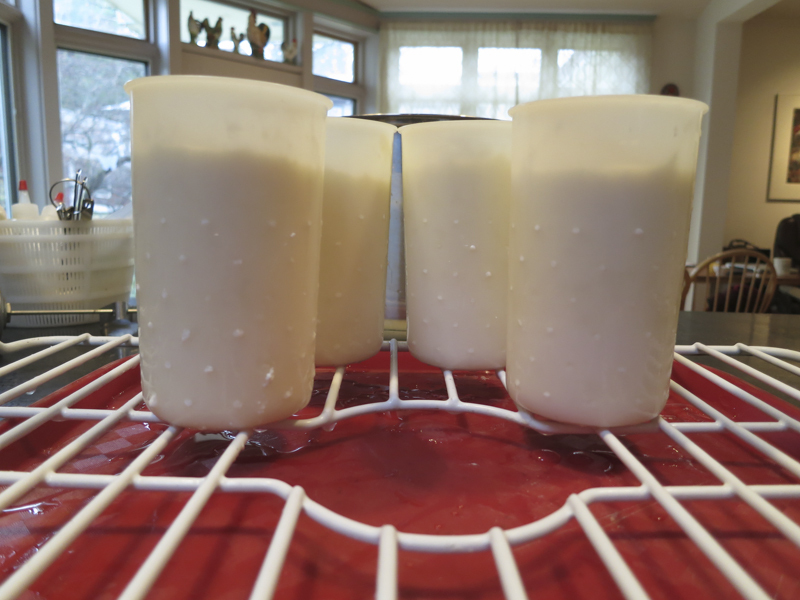 Once all of the curds have been ladled into forms, allow them to continue draining for another 16-24 hours at room temperature. Again, the longer it drains the drier the finished cheese. As the whey drains the cheeses will drop in the molds and should be covered loosely with Butter Muslin as they sit. There are many different shapes and sized cheese molds that you can choose from so be sure to have fun with your selection. Once the cheese has drained it should be transferred to a fridge in the molds until ready to use (the cold will also allow them to firm up). This is a fresh cheese so it should be eaten fresh. When ready it can be un-molded or scooped into a bowl (if using larger forms), a little cream poured over the top, and even a little sugar or honey to balance that zingy flavor. A little home preserve or fresh fruit might also be nice. At this point your imagination is your only limitation. Traditionally they kept it simple, but no reason you can not experiment a little. It should last for a week to 10 days but sooner is better for this cheese. Before I began my research, this was not a cheese that I knew much about. In fact it wasn't even on my radar until we began getting a number of our customers asking how to make it. Once I began my research, what I found was a very beautiful piece of regional cheese history and the story of several people bringing this cheese back to life. I really love the history behind these traditional cheese making processes, as well as the people that make them. My development of the recipe began by gleaning several recipes from others, like chefs Emeril Lagasse, and John Folce from Bittersweet Dairy. I have made a few changes to this and I hope it will meet the approval of those that remember this cheese, as well as those making it again. In the spring when I created this recipe, 'Old Man' had finally relaxed his grip on the North East and so I was ready to celebrate by making this wonderful cheese. This is a cheese that had disappeared but is back again. 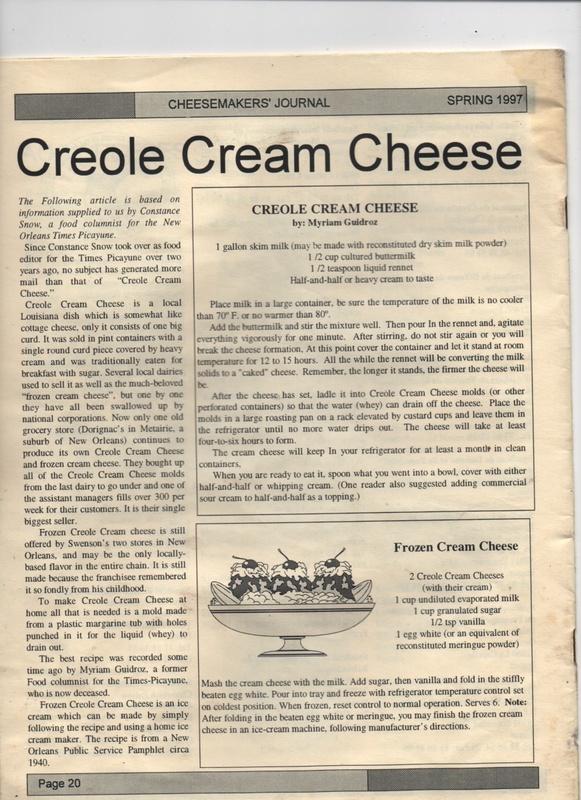 A real piece of cheese history from the Creole Country of Louisiana. Creole Cream Cheese is a farmer style cheese similar to a combination of cottage cheese and sour cream. Today, Creole cream cheese is again being made by a few dairies in the region. The cheese is made with a blend of skim milk and half & half cream. 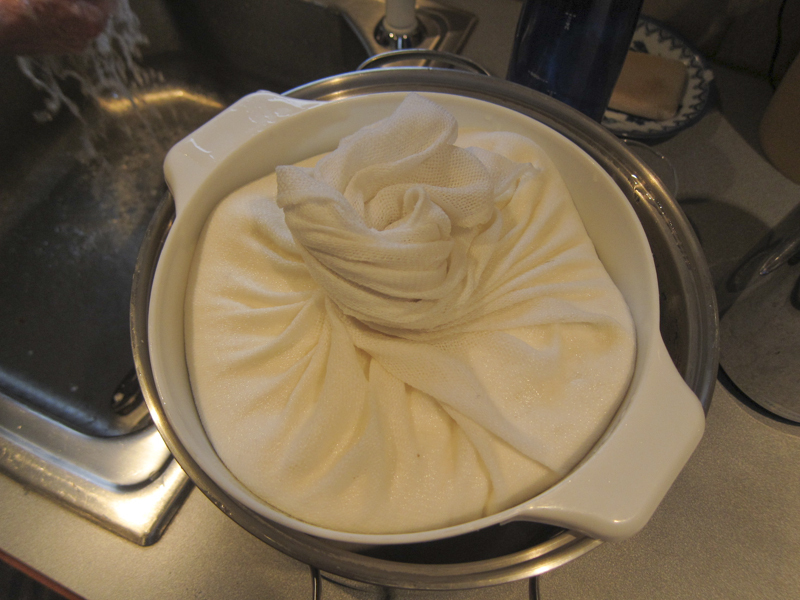 Once the curd is made and drained, a little heavy cream is poured over it. Adding fat to lean makes sense to me, considering that 'Mardi Gras' does mean 'Fat Tuesday' after all! One of my favorite ways to eat it is, spooned into a bowl, covered with either half-and-half or whipping cream, and served with fresh fruit. Yum! This style of cheese was thought to have been brought to Louisiana from the Brittany and Burgundy regions of France, and was extremely popular in the area in the 1800s through the 1980s when production ceased. 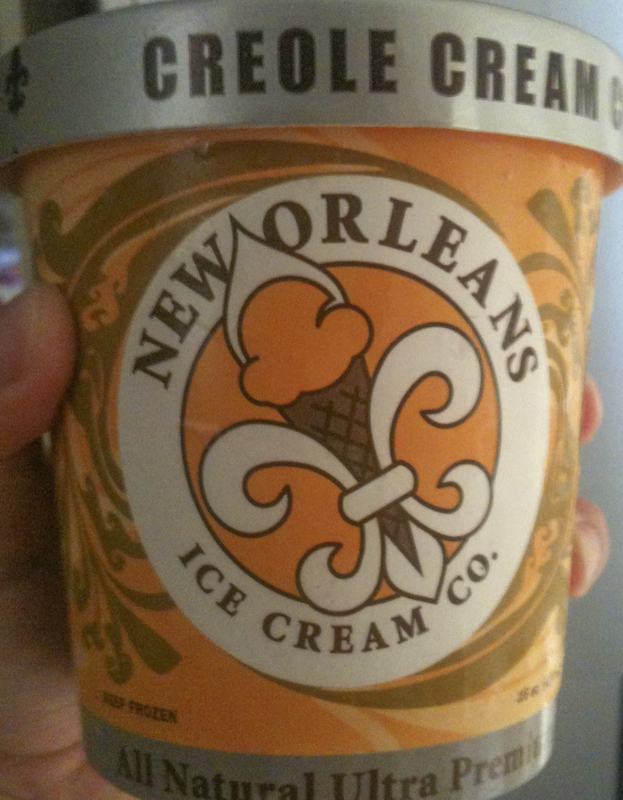 Although originally a product of France, many New Orleans dairies, such as Goldseal and Borden, supplied the city with the product for many years. Acadians called this 'Caille Goute', or Creamed Clabber (clabber being a naturally fermented milk), and it was often made by the family at home as well. The ‘Cream Cheese Woman’ is still as common a sight on our New Orleans streets as the Cala Woman was in the days gone by. She carries a covered basket in which are a number of small perforated tins in which the Cheeses are. In her other hand she carries a can of fresh Cream. She sells her wares to her regular customers, for the old Creoles who do not make their own Cream Cheese are very particular as to whom they buy from, and when once a good careful, clean woman gets a ‘customer’ she keeps her during her period of business, coming every fast day and Friday with her Cheese and Cream, for this is a great fast-day breakfast and luncheon dish. 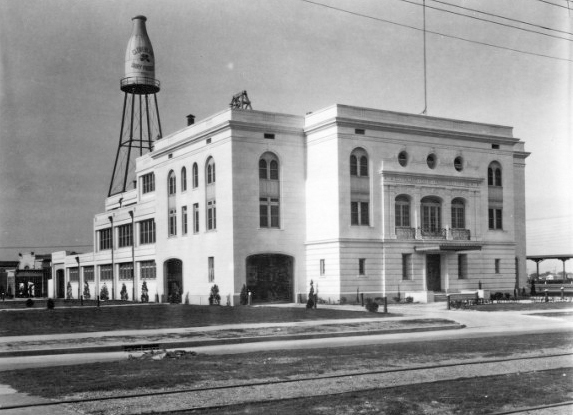 The cheese was made by several small dairies in the New Orleans area for many years, but began to disappear as these family dairies were absorbed into larger production dairies or just plain went out of business. Since the late 1990's, Creole cream cheese has undergone a quiet revival due to the work of food preservationist Poppy Tooker and fans who grew up on it. During the early 2000's the inclusion of Creole Cream Cheese into Slow Foods Ark of Taste brought back a revival of this cheese. 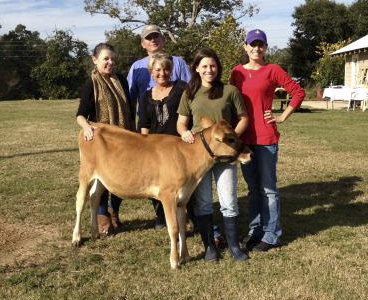 One of the larger producers today is the Mauthe Family Dairy. Over time, Kenny and Jamie Mauthe transitioned from milking 150 cows and selling all their milk to a gigantic co-op, to milking just a couple dozen cows, processing the milk themselves and selling it to customers directly at farmers’ markets. When they downsized, around 2000, the Mauthes also resurrected the old Louisiana dairy farming tradition of producing Creole cream cheese. 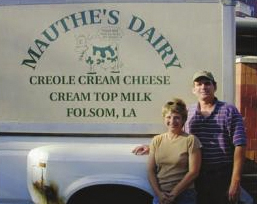 While there was one other small producer in the area at the time, many locals credit the Mauthe's product with saving Creole cream cheese from extinction. We have been told that the Mauthe's version tastes like a cross between ricotta and creme fraiche with a hint of buttermilk. 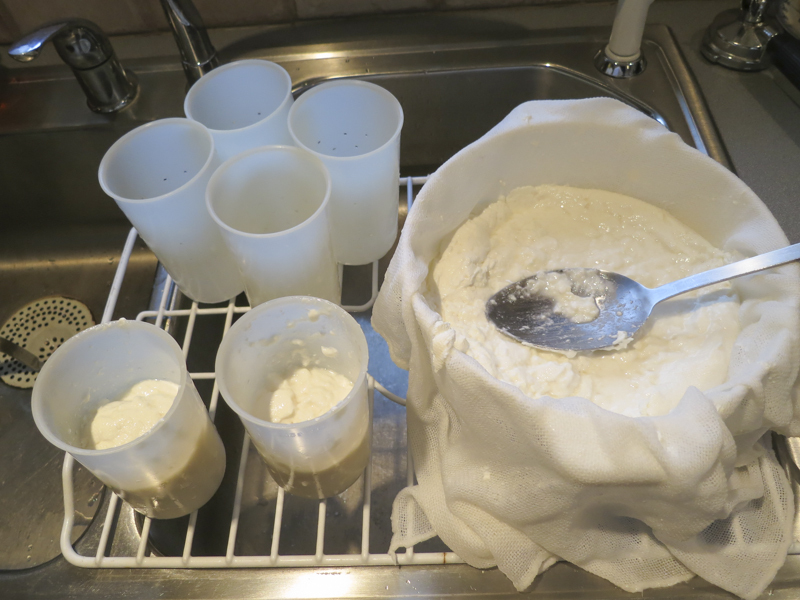 Traditionally, raw milk was used to make this cheese, no culture or rennet added, and the cheese drained in cloth bags before being placed in molds. Many of the Creoles, however, make their own cream cheese as follows: The clabber is placed in a long bag of muslin and put to drain, the bag being tied tightly and hung out over night in a cool place [Sometimes outdoors hanging from a tree limb]. When ready for use, the bag is opened and the cheese is taken out and beaten till light. It is the placed in these perforated molds, and when time comes for serving, it is taken out, placed in a dish, and sweet cream poured over it. It is eaten with sugar or salt, more generally sugar." You can try this with the full fat milk or even raw milk as well. I have read that the milk of choice was the richer milk from Guernsey or Jersey cows. 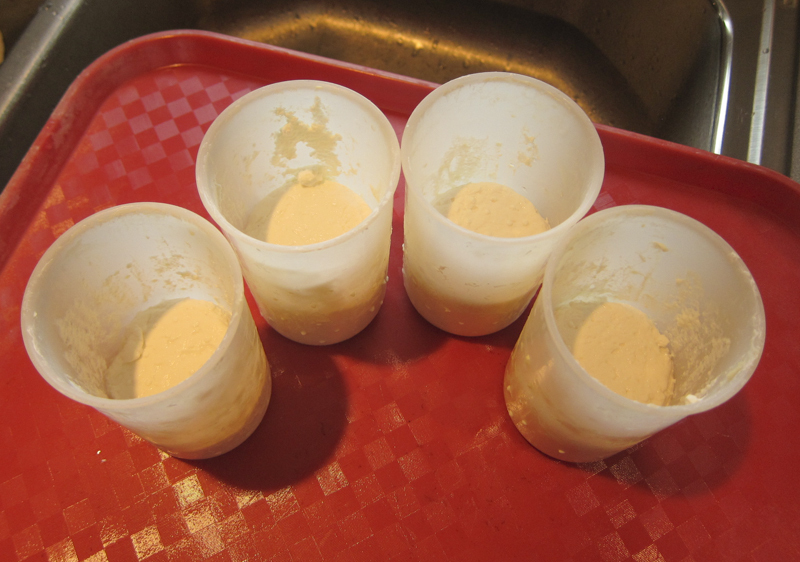 The natural clabber should only be attempted with a very high confidence in your raw milk quality, so be careful. 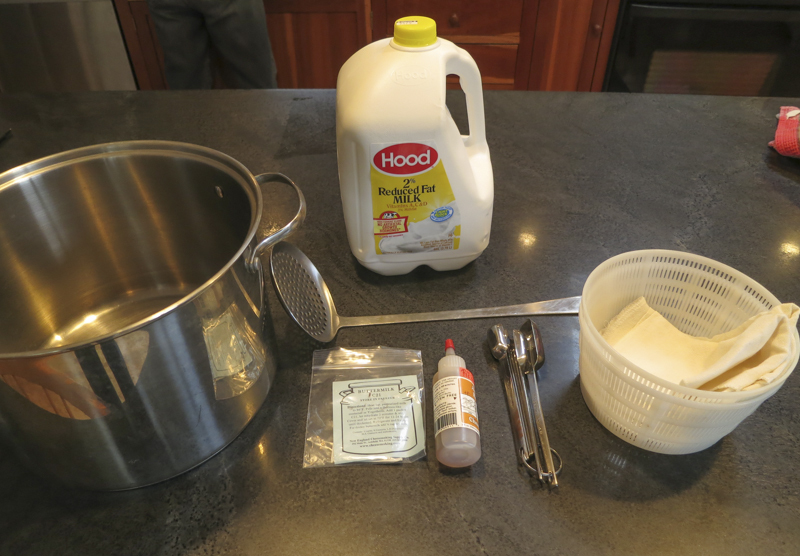 The natural clabber should NEVER be attempted with pasteurized milk. The 'no-rennet' will work as a full lactic coagulation but may take longer and the cream will rise during the set. As a final note, I received this page from Alyce in Alabama. She pointed out that Ricki had published a newsletter years ago (Part of her rep as the 'Cheese Queen'). Even 17 years ago when Ricki published this, the references were from a time long before that. Check out that yummy Frozen Cream Cheese recipe from 1940 and enjoy.